Stevia is an herb indigenous to Paraguay and Brazil that grows 2--3 feet tall and resembles mint in appearance. The South American native Guarani Indians used this green "sweet herb" they called "kaa he-he" for centuries before a European botanist named M.S. Bertoni first learned of this unique plant from the native guides while exploring Paraguay in 1887. Though prior to the early 1900s Stevia was a plant harvested in the wild it soon thereafter was being grown in abundance on plantations. Sometime between 1918 and 1921 the USDA was introduced to this wonderfully sweet herb but because of political and other interests Stevia was not accepted as a natural sweetener. The compounds in Stevia that give the herb its sweet taste called Steviosides were isolated by French scientists in 1931. Since the 1970s Japan has approved and used Stevia extracts as a sweetener in everything from ice cream to soft drinks. Stevia rebaudiana is a natural herb that grows in Asia and South America. This supplement is a 100% pure concentrated extract of Stevia. South American natives have used Stevia for centuries; though it has just recently become popular in the United States. 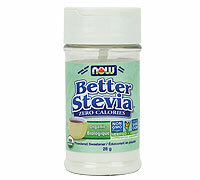 NOW® Stevia Extract is made with a high glucosylstevioside content and has a pleasant, non-bitter aftertaste. Directions: As a dietary supplement, take 1/2 to 1 level scoop as desired.